...introduces one of a kind artist soft sculpture bears and other creatures which are completely designed and hand sewn by me, Melisa Nichols. I create using a variety of materials including mohair, faux fur and recycled fur. Please click the "About Me" page above for more details. My recycled fur creations are made from vintage fur coats and collars that have been damaged in some way... I only use the good pieces to create a work of art to treasure :o) My real fur pieces are fully lined for more durability. I hope that, by using this medium in my artwork, I am showing dignity to these animals who were sacrificed for fashion. I also feel that I am helping the environment by recycling. This is cute... #17 in this video is my soft sculpture pygmy marmoset. ***SHIPPING*** ~ I usually offer free surface shipping anywhere in the world. This includes up to $1000 insurance for most countries (Canada Post will not insure to all countries). Free shipping usually takes 1 1/2 to 2 weeks to US destinations and 6 to 8 weeks to overseas destinations. Please contact me for a quote if you would like to use Xpresspost instead which takes about 3-5 days to US destinations and about 6 days to overseas destinations. Photos hosted by ebay can be seen for about 90 days after the listing ends. 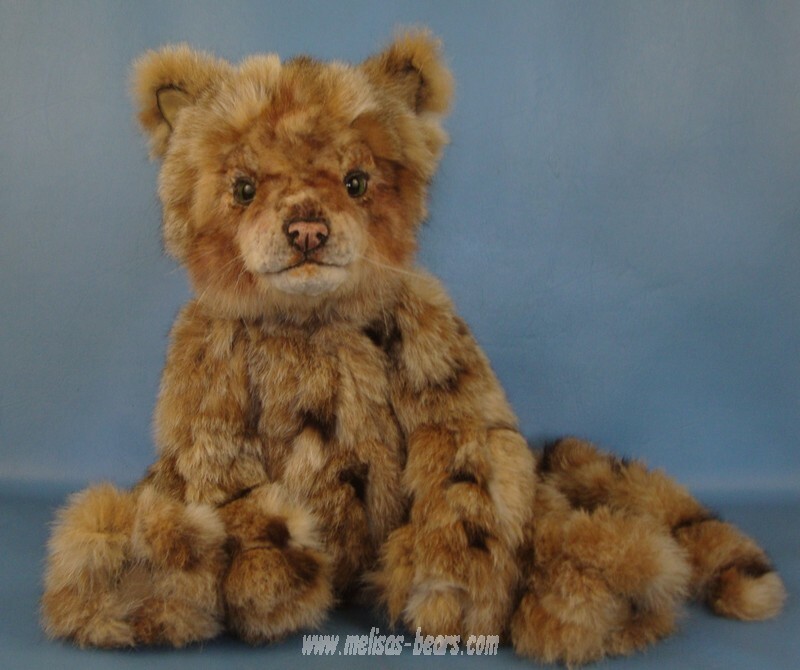 *** Available *** Hyder is a sweet 24" Grizzly Bear Cub created from recycled rabbit fur! He is loaded with details! Please click on his picture to see more photos and all his details. *** Adopted *** Butternut is a sweet 24" Rare Male Calico cat doll created from recycled vintage lynx and mink fur! He is loaded with details! Please click on his photo to see his auction. *** Adopted *** Abyassa is an adorable baby monkey created from recycled mink fur! He is 4.5" tall (without his tail. He has open/close eyes and loads of detail! Please click on his photo to see all his details and photos. *** Adopted *** Baffin is an adorable polar bear cub created from recycled mink fur! He is 5" tall and has open/close eyes, and open mouth, and loads of other detail! Please click on his photo to see all his details and photos. *** Adopted *** Monyet is the sweetest little baby monkey! 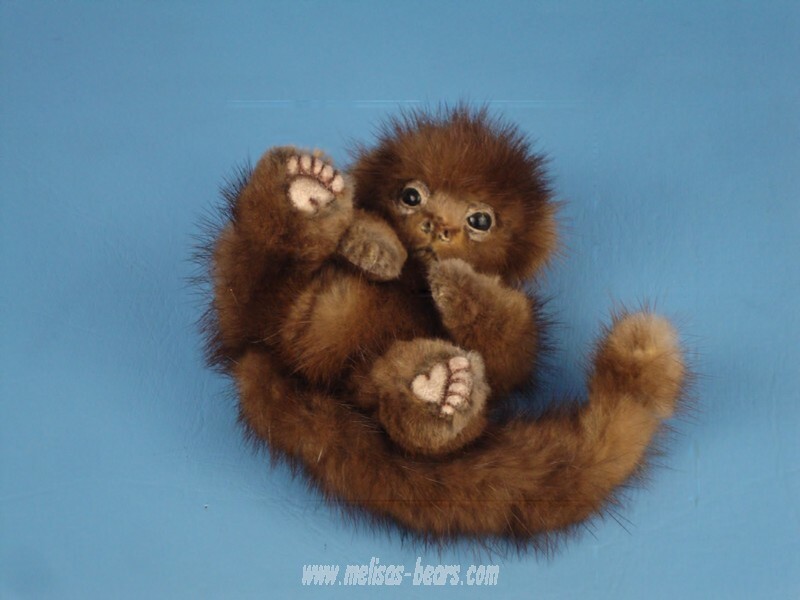 He is 4.5" tall (without his tail) and made from recycled mink fur. He has open/close eyes and loads of detail! Please click on his photo to see all his details and photos. *** Adopted *** Wibble is a fluffy handful of a baby penguin! He is 3 1/4" tall and made from recycled mink fur. He has open/close eyes and loads of detail! Please click on his photo to see all his details and photos. *** Adopted *** Barrett is a super cuddly 24" recycled martin fur brown phase black bear cub with open/close eyes and loads of detail! Please click on his photo to see all his details and photos. *** Adopted *** Oliver is an adorable 2.5" synthetic fur kitten with open/close eyes and loads of detail! *** Adopted *** Shikoba is an adorable 11" synthetic mink fur black bear cub with open/close eyes and lots of detail! Please click on his photo to see all his details and lots more photos. *** Adopted *** Duke is a sweet miniature puppy with open/close eyes and loads of realistic detail! Please click on his photo to see his auction with lots more photos and all his details. *** Adopted *** Kuruk is an 10" recycled mink fur Kermode bear cub! Please click on his photo to see his auction with all his details and lots more photos. *** Adopted *** Kalum is an 11" synthetic mink fur black bear cub! Please click on his photo to see his auction with all his details and lots more photos. *** Adopted *** Aglu is a miniature recycled mink fur Harp Seal Pup with open/close eyes and an open mouth! Please click on his photo to see his auction with all his details and lots more photos. *** Adopted *** Natsiq is a recycled mink fur Harp Seal Pup with open/close eyes! Please click on his photo to see his auction with all his details and lots more photos. *** Adopted *** Bisde'y is a 9" recycled rabbit fur grizzly bear cub with open/close eyes! Please click on his photo to see his auction with all his details and lots more photos. *** Adopted *** Bandit is a Chihuahua Puppy with open/close eyes and loads of realistic detail! Please click on his photo to see his auction with lots more photos and all his details. *** Adopted *** Bao Hui is a recycled rabbit fur panda bear cub with open/close eyes and a movable open mouth! Please email me if you are interested in adopting him - melisan@telus.net . *** Adopted *** Abby is a Chihuahua Puppy with open/close eyes and loads of realistic detail! Please email me if you are interested in adopting her - melisan@telus.net . *** Adopted *** Bao Rou He is a miniature recycled mink fur panda bear cub with open/close eyes! Please click on his photo to see his auction with all his details and lots more photos. *** Adopted *** Akki is a 4.5" polar bear cub with open/close eyes! You can click on his photo to see his previous auction all his details and lots more photos. *** Adopted *** Knotts is a French Bulldog Puppy with open/close eyes and mouth! Please click on his photo to see all his details and lots more photos. *** Adopted *** Bao Shuo Lou is a huge 28" panda bear cub with open/close eyes and a movable open mouth! Please click on his photo to see all his details and lots more photos. *** Adopted *** Hunter is a 26" Canadian Lynx cat doll with open/close eyes! Please click on his photo to see all his details and lots more photos. *** Adopted *** Anyu is a 26" polar bear cub with open/close eyes and mouth! Please click on his photo to see all his details and lots more photos. *** Adopted *** Bao Jin Bao is a sweet 12" panda bear cub with open/close eyes and a movable open mouth! *** Adopted *** Royale is a big hug of a lion teddy bear who has gorgeous glass doll eyes. Please click on his photo to see all his details and lots more photos. *** Adopted *** Bao Ai is a sweet 12" panda bear cub with open/close eyes and a movable open mouth! Please click on her photo to see all her details and lots more photos. *** Adopted *** Wayra is a 29" grizzly bear cub with open/close eyes and mouth! Please click on his photo to see all his details and lots more photos. *** Adopted *** Bao Mingzhu is a sweet 12" panda bear cub with open/close eyes and a movable open mouth! Please click on her photo to see all her details and lots more photos. *** Adopted *** Sweet Pea is a recycled mink duckling with open/close eyes! Please click on his photo to see all his details, purchase info, and lots more photos. *** Adopted *** Karu is a sweet 12" black bear cub with open/close eyes! Please click on his photo to see all his details and lots more photos. *** Adopted *** Broccan is an extremely detailed and realistic baby European badger made from recycled rabbit fur! Please click on his photo to see his all his details and lots more photos. *** Adopted *** Mallow is a 4" duckling with open/close eyes! Please click on his photo to see all his details, purchase info, and lots more photos. *** Adopted *** Kitasoo is an very detailed and realistic Kermode bear cub made from synthetic fur! Please click on his photo to see his all his details and lots more photos. *** Adopted *** Bao Tang is an extremely detailed and realistic panda bear cub made from recycled rabbit fur! Please click on his photo to see his all his details and lots more photos. *** Adopted *** Piper is a recycled mink duckling with open/close eyes! Please click on his photo to see all his details, purchase info, and lots more photos. *** Commissioned *** Beeker is a synthetic fur duckling with open/close eyes! *** Commissioned *** Cayu is a recycled mink duckling with open/close eyes! *** Adopted *** Yuki is an adorable baby kitten with open/close eyes and mouth! Please click on her photo to see all her details, lots more photos and how to adopt. *** Adopted *** Snuggles is an adorable baby owlet with open/close eyes! He is 2.5 inches tall. Please click on his photo to see all his details and lots more photos. *** Adopted *** Pahana is a sweet 24" Kermode bear cub with open/close eyes! Please click on his photo to see all his details and lots more photos. *** Adopted *** Neytea and Scandi are adorable baby owlets with open/close eyes! They are about 2.5 inches tall and come with their own little nest. Please click on their photo to see all their details and lots more photos. *** Adopted *** Gitwangak is a sweet 24" black bear cub with open/close eyes! Please click on his photo to see all his details and lots more photos. *** Adopted *** Humphrey is a sweet 22" polar bear cub with open/close eyes! Please click on his photo to see all his details and lots more photos. *** Adopted *** Bao Hao Wan is an adorable 4.5" panda bear cub with open/close eyes! Please click on his photo to see all his details and lots more photos. *** Adopted *** Timothy is a sweet 5" wild bunny rabbit with open/close eyes! Please click on his photo to see all his details and lots more photos. *** Adopted *** Tixwa is an adorable 4" Kermode bear cub with open/close eyes! Please click on his photo to see all his details and lots more photos. *** Adopted *** Pippin is a 5" duckling with open/close eyes! Please click on his photo to see all his details and lots more photos. .
*** Adopted *** Sylvan is a one of a kind baby Sasquatch with open/close eyes! Please click on his photo to see his previous auction which has all his details and lots more photos. To adopt him, please email me using the "email me" link near the top of this page. *** Adopted *** Peeps is a 5" duckling with open/close eyes! Peeps was adopted immediately, but if you are interested in your own baby duck, please see my commission page by clicking on the link at the top of this page. *** Adopted *** Spring is a 4" duckling with open/close eyes! Spring was adopted immediately, but if you are interested in your own baby duck, please see my commission page by clicking on the link at the top of this page. *** Adopted *** Lacy is a 4" Persian kitten with open/close eyes! Please click on her photo to see all her details and lots more photos. *** Adopted *** Bao Ping is an adorable panda bear cub made from recycled mink from a vintage stole! If you are interested in commissioning your own panda, please visit my commissions page by clicking the link near the top of this page. *** Adopted *** Hotah is a 6" Snowy owlet with open/close eyes! Please click on his photo to see all his details and lots more photos. *** Adopted *** Ahanu is a 10" grizzly bear cub with open/close eyes and mouth! Please click on his photo to see all his details and lots more photos. *** Adopted *** Baby Kin is a miniature 1:12 scale dollhouse teddy bear cub! Please click on his photo to see all his details and lots more photos. *** Adopted *** Branwyn is a rare white raven chick made from recycled mink from a vintage stole! Please click on his photo to see all his details and lots more photos. *** Adopted *** Philo is a miniature 1:12 scale dollhouse teddy bear! Please click on his photo to see all his details and lots more photos. *** Adopted *** Tahnee is a baby owlet made from recycled fitch fur from a vintage stole! Please click on his photo to see all his details and lots more photos. *** Adopted *** Flurry is an extremely detailed and realistic polar bear cub! Please click on his photo to see his auction with all his details and tons more photos. *** Adopted *** Bao Tian Mei is an extremely detailed and realistic panda bear cub made from recycled mink from a vintage coat and a vintage stole! Please click on his photo to see his all his details and lots more photos. *** Adopted *** Zabu is a large baby giraffe created from recycled rabbit fur. Zabu is 33" tall and he has a lot of detail. :o) . *** Adopted *** Gray Storm is an extremely detailed Canadian Timber Wolf! Please click on his photo to see his auction with all his details and lots more photos. *** Adopted *** Sasta is an extremely detailed and realistic grizzly bear cub! Please click on his photo to see his all his details and lots more photos. To see previous creations, please click on the "Galleries" button at the top of this page. I hold the copyright to all these pieces as well as to the photographs I have taken of them. They are not free for use. To see my current auctions on eBay please click here. Please CLICK HERE to see pictures of recently adopted bears and friends. All my bears come with a signed, dated and laminated tag. Smaller bears are gift boxed. They are made for display only - not suitable for children due to tiny parts. Layaway is also available... please see my current or a recent auction for details or feel free to email me. Layaway payments are non-refundable. Copyright , Melisa's Bears. All Rights Reserved.